iTunes compilations: what holds them together? When you rip a CD in iTunes—or when you buy an album from the iTunes Store, Amazon, or other vendor—there are a number of tags you can set, such as the album name, artist name, and genre. But there’s one tag that seems to confound a lot of iTunes users: the compilation tag. Here’s an overview of what the compilation tag means, what it can do for you, and how to work with it. First, what exactly is a compilation? Technically, it’s an album with multiple artists but not, for example, a best-of album by a single artist (although the iTunes Store does in fact consider many Greatest Hits albums to be compilations). Since iTunes and the iPod can sort music by artist, when you go to view an album by a given artist, you expect to find full albums. But with compilations—say a movie soundtrack with songs by ten different performers, or a Time Life collection of the greatest cowboy songs to sing along with in the shower—you’d only find one or two songs under an artist’s name. Also, you wouldn’t be able to play the entire album without creating a playlist for it, or by searching for the precise album name. For this reason, iTunes has a compilation tag that you can set to give special status to these “various artist” collections. 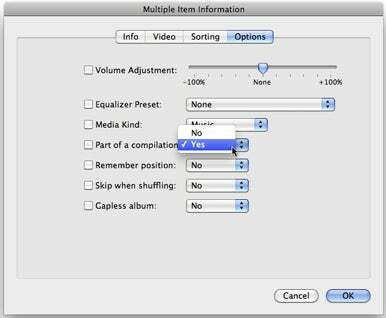 You can change the compilation status of any album by selecting its tracks and choosing Yes or No from the Part of a compilation menu. Setting this tag on a group of tracks—it’s one you toggle between Yes and No—has a number of effects. First, it groups the album together rather than leaving the music spread out among its various artists (as long as all the tracks have the same album name). For example, if you use the iTunes Browser (Command-B shows or hides the Browser, and the View -> Column Browser submenu lets you choose how it’s displayed), tracks in compilations won’t show under the names of their artists, unless you have other, non-compilation albums by the artists on the compilation. If you have the Composer tag filled, however, all tracks from compilations will show up in the Composer column of the Browser. A practical option in iTune’s Advanced preferences lets you group compilations at the top of the browser: check Group Compilations When Browsing, and you’ll see a Compilations entry at the top of the Artists column so you can find your compilations easily. Setting an album as a compilation—or not—is easy to do. Select all its tracks, then press Command-I, and click the Options tab. Choose Yes or No from the Part Of A Compilation menu, then click OK. Viewing compilations on your iPod is a bit different from iTunes’ solution; there’s no option to group compilations under the Artist menu, but if you go to Settings -> Music Menu, you can check Compilations and have your iPod display a Compilations sub-menu. On an iPhone or iPod touch, however, Apple decided that it would be better to list songs from compilations under their artist names. However, you have a choice; if you tap Music, then More, there’s also a Compilations menu, so you don’t need to change any settings to find your compilations. Unfortunately, you can’t turn off the display of compilation tracks in the Artists list, and if you have a lot of compilations, your Artists list can get pretty long. While compilations can be great, they can also be a headache. Let’s say you rip a CD and can’t find it in your library. This can happen if the Gracenote tag information, which iTunes searches for on the Internet when you insert a CD, has the Compilation tag incorrectly set for that album. You can change it, of course, but you may scratch your head trying to find the album to do so. For this reason, you might want to always have compilations display in the browser (assuming you use the browser), or create a smart playlist with the condition Compilation is true, so you can always find your compilations. Another problem related to the Compilations tag occurs when only some songs of an album have that tag set. You may find an album in iTunes that shows as if it were two separate albums. Select all the tracks and set the Compilation tag to No to group the songs correctly. One final curiosity related to compilations. Since iTunes doesn’t record these albums by the names of their artists, it stores the files in a special way. In your iTunes Media (on iTunes Music) -> Music folder, you’ll find a folder named Compilations with all of albums tagged as such.